It took me about a month to get it done, but I sewed up my first pair of Lazo Trousers from Thread Theory. The pattern isn’t hard at all, November was just slow going on the sewing front. I originally picked up the Lazo pattern hoping to use them to knock off this look I found on pinterest, but my interest in that project has waned. Picking up a big bag full of discounted closures at Hobby Lobby did bring the Lazos back into focus though. I really like the look they have with two buckles at the waistline and now I can totally do that. The Pattern: Lazo Trousers in size 10 and shortened 2in. After my muslin, I pinched out a 1/2in wedge from the center back yoke. Pattern feedback- 1. you should stay-stitch the upper edge of the pants after making your pleats, not after you’ve constructed the whole pant and inserted the fly. I didn’t have a problem with my fabric stretching, but play it safe and do this step early on. 2. I’m not a fan of attaching the zipper to the fly shield as it doesn’t look as neat on the inside. I really like the fly insertion instructions from the Liana Jeans and often use them when making other pants. 3. I inserted the belt tabs into the waistband seam for extra security and a neater finish. The Fabric: Organic Tencel in navy from DG Patterns shop. If you haven’t sewn with tencel yet I really encourage you to pick some up and give it a whirl. Tencel has nice drape and is super soft to the touch. The silk setting on my iron seamed to work best in combination with a pressing cloth. Direct pressing tended to leave a mark and slight sheen on multiple layers. Tencel woven is one of the recommended fabrics for the Lazos and would work well with any pant, skirt, or dress that needs a nice drape. You might also like The modern striped boatneck top I’m wearing. The Uvita is a relaxed, dropped-shoulder top perfect for getting comfy and cozy in the cool weather. I wanted to do a colorblocked version in French Terry from my stash and this color combo of greys ended up working the best together. The good thing is I busted some remnants, the bad thing is I made myself yet another grey top to add to my stacks of grey tops for fall/winter. My new Uvita pairs perfectly with my Liana jeans. The Liana’s are the first pair of pants/jeans I ever made almost two years ago now. Aren’t they holding up well? These are going to last me a good while. I made my second pair of Liana’s last fall and had a little hiccup with the waistband. I over stretched the front corners so they look weird and I forgot to add the twill tape to stabilize the top edge of the wasitband and that turned out to be a big woopsie in this stretch denim. As I wear them, the top edge of the waistband stretches and flips out in the front. It is totally annoying. I thought I could live with it, but no. These are under alteration so I can love them like they deserve. My third pair of Liana’s is in the planning stage. I have a medium blue denim washed and ready, but I can’t seem to get past the step where it is just sitting on my cutting table. If you are ready to get the Liana Jeans Pattern, Itch to Stitch is offering the patterns featured in today’s tour posts for a special one day sale price. The Liana Jeans* are $9 , Mila Top $9, Anza Dress $9, Arenal Top $9, Bonn Shirt & Dress $9, La Paz Jacket $9, and Beasoleil Top & Dress $9. The Uvita top is FREE everyday. Mabel Madison, one of the tour sponsors is offering $10 off a $50 order with the code ITSTOUR through September 30th. *This post contains Itch to Stitch affiliate links. If you purchase through my links, I get a small commission that I put toward my sewing hobby. I chose a sweater knit from The Fab Clique to make my Michelle cozy for fall. I’m really liking this redish color on me. I started with a size 10, per the sizing chart, but ended up sizing it down to an 8 from the waist up. It’s a roomy fitting top so you may want to choose your size with that in mind. I do have a little tip on the Michelle construction. 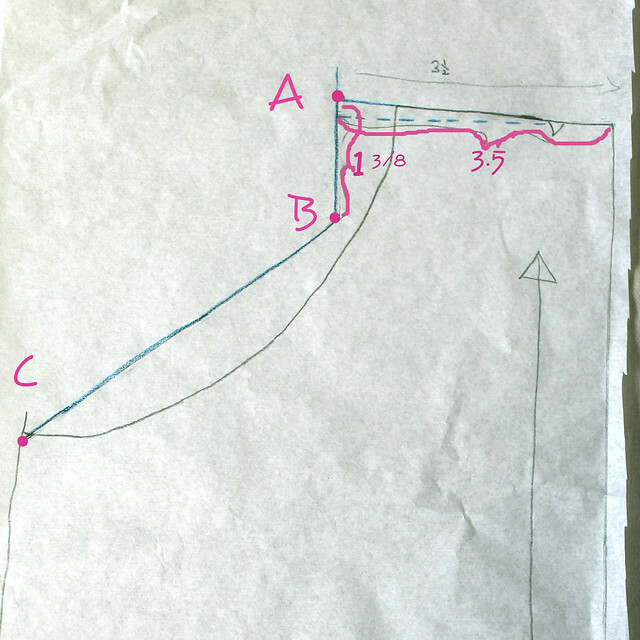 When you fold up the front curved hem there is a slight gap (shown in blue) between the hem allowance and the side seam. In most knits this probably isn’t a problem, but in the sweater knit it created a weak point between the side seam and the upturned hem. To avoid this you can stretch the fabric in the hem allowance to be caught in the side seam or you can include an extra tab of fabric when cutting to make sure the hem allowance reaches the side seam. I used a lightweight (6-7oz) stretch denim from deep in my stash for the Robinsons and boy do I wish I could photograph black better so you could really see them. The designer has combined comfort and style in the Robinsons. 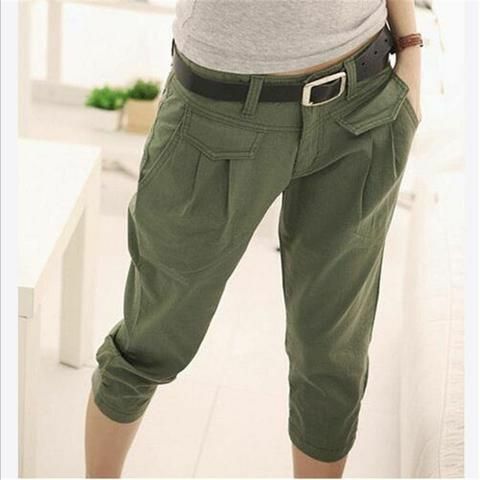 The elastic waistband and easy fit are paired with a faux fly, nice sized front slash pockets, optional patch pockets for the back, and several finishing options at the ankle to make these more than a simple pair of pull on pants. I chose to make the exposed zipper and tab closure at the ankle ’cause that’s just my style. I think they look pretty cool. 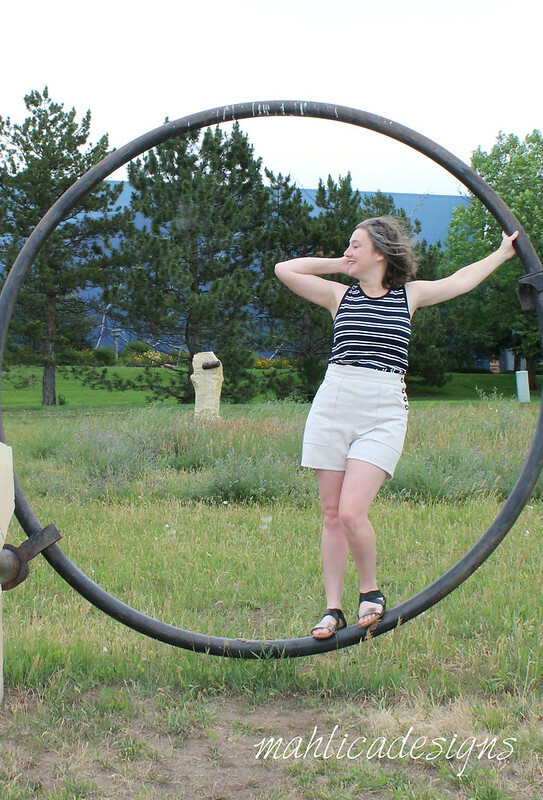 All week we have sewing bloggers sharing how they say Sew Long Summer. The full tour includes these talented sewists, so I hope you’ll follow along. We can’t wait to see what you’re making. *This post may contain affiliate links. If you purchase through my links, I get a small commission to help pay for my sewing hobby. I’ve been keeping it pretty simple in the sewing room this summer. Can we say Summer Break! Working through my stash has been a motivator though. My feelings about my stash tend to swing between “I’m glad to have this resource” to “I’m never going to be relieved of this burden.” This summer I’ve been in the “stash burden” zone as stash overflow has piled up in front of my fabric shelves. Making the Dana top and a pair of Chi Town shorts to go with, helped bust through some stash and were pretty easy projects for my lazy summer approach to sewing. I originaly planned to replace the side tie on the Dana with a cool looking buckle, but when it came to it the buckle just looked and felt too heavy. Any suggestions? I feel like something to add a little interest would be good. The Pattern The Dana top from DG Patterns in size 10. Made without the side tie. I added two hidden snaps along the cross over to keep the top from gaping open at the bust and when I bend at the waist. If you’re looking for an easy pattern that gives you a nicely put together look, I think the Dana top is a good pattern for you. Chi Town Chino shorts. These are my fourth pair, so nothing new to add. See my previous pairs here and here. The Fabric Dana was made in a shirt weight woven that I picked up from Hancocks before they closed down. These Chi Towns are made in a cotton twill I picked up from Joann Fabrics. Total stash busted: 1.25 yards for Dana and 1 yard for Chi Towns. This post may contain affiliate links. If you purchase through my links, I get a small commission to help pay for my sewing hobby. 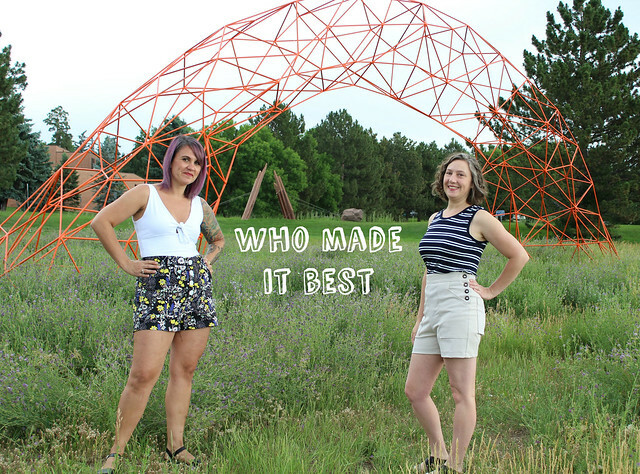 I got a lot of positive feedback on my Sail Away Lander shorts that I made in the Who Made It Best challenge. They turned out pretty close to my vision, so I’m happy. If you’d like to make a pair for yourself or borrow any of my ideas, I’ve put together a tutorial of my modifications to make it easier for you. Check out my Sail Away inspiration board for even more ideas. I made modifications that fall into three categories: 1. Angle the pocket opening 2. Lengthen for a higher waist and 3. Relocate the fly closure. I’ll also share how I attached my slotted buttons. Size: I originally made a pair of Lander pants and shorts in size 10 per the measurement chart. I like the length I get in that size, but really needed to size down to an 8 for a better fit in the width. For my Sail Away Landers I wanted a pretty slim/snug fit in the stretch twill, so I sized down even further to a 6, still keeping the length of my pieces at a size 10. 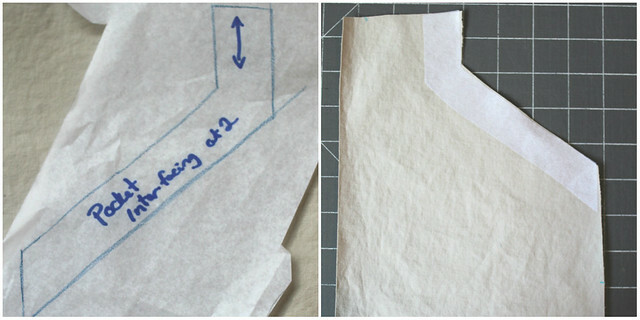 Next up you’ll need to draw a new pocket interfacing piece. Simply trace your new angled pocket edge and draw a matching line 1in away to create the new piece. I measured down 1 1/2in from top of the side seams (front & back pieces) to mark my lengthen line. Your lengthen line should be perpendicular to the grain line. Cut and spread 1in (or more). I’m short-waisted so 1in was plenty for me. I chose not to lengthen my pocket piece. If you choose to, I suggest lengthening below the angled pocket opening, so you don’t skew those proportions. We’re mostly just switching up the construction a little. 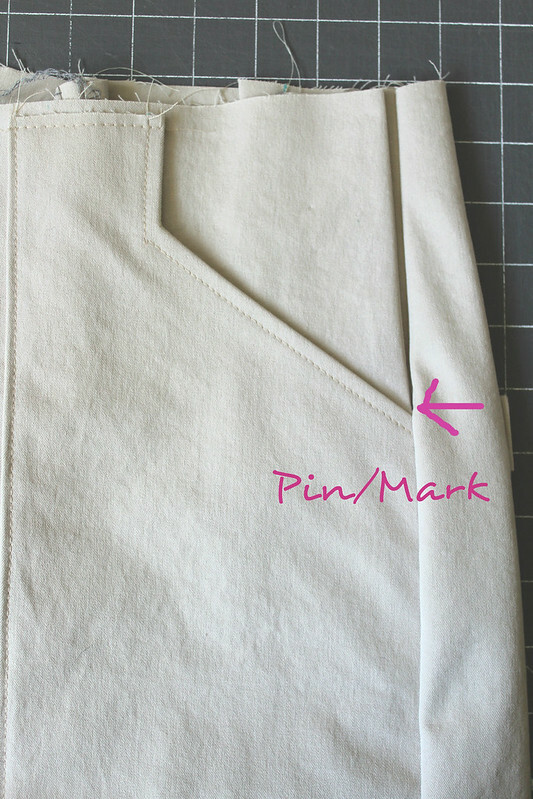 Pin or mark just above the pocket on the side seam. Stitch the side seam closed from bottom(hem) up to your marking and back stitch to reinforce. The dot marking on the fly pieces will match up to the top of your side seam stitching. 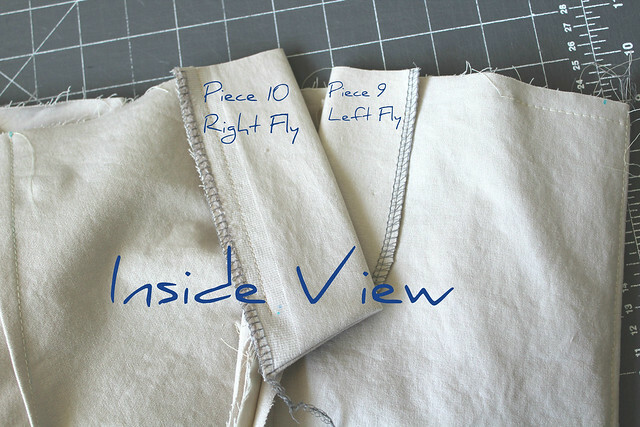 In the pattern instructions the left fly attaches to the left (as worn) center front and the right fly piece attaches to the right (as worn) center front. Instead, you will attach the Left fly to the Front pant/short piece and the Right fly to the Back pant/short piece. 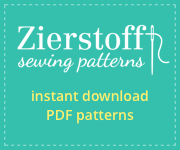 Follow the pattern instructions for completing the fly and button closure. 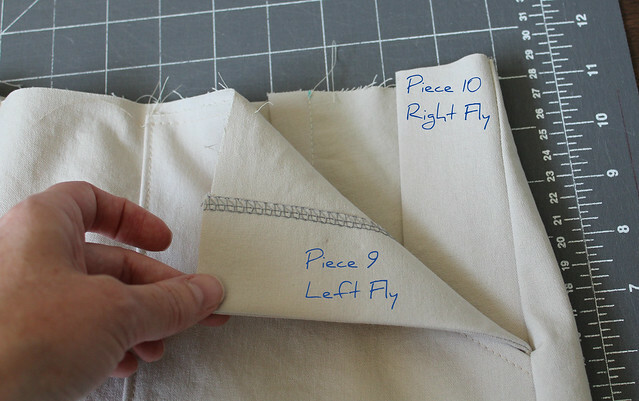 The fly pieces as cut will extend up past the waistline, simply trim any excess. Once you have the fly completed, you’ll want to add a securing bar tack through the two fly pieces. Make sure they are laying flat over each other like they do when the fly is closed. Pin together and sew the bar tack through the two layers. Note: Moving the fly to the side will make the pattern notches on your waistband irrelevant, but you’ll be fine. Simply attach following the directions and ease any areas that need it. I’ve made two Landers before, so I knew I would be ok with a shorter side fly. I made mine with stretch twill, so going down a size and the shorter fly still works for me. Raising the waist may require further alterations of your CB seam, darts, and possibly the waistband. I turned to the Self Sewn Wardrobe facebook group for direction with these. 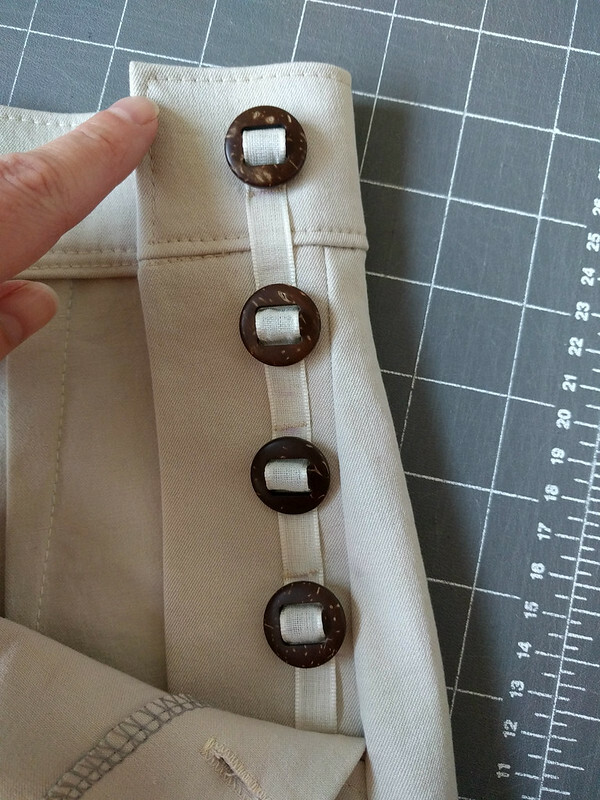 I got the suggestions that these are attached with a ribbon, twill tape, or self fabric running through them and an example pic from a rtw jacket with this type of closure. I haven’t found a tutorial to verify that I did this properly, but this will get you started. If you have any suggestions, I’d love to hear them. Your ribbon will run right down the middle of your buttons, so mark your button placement to the outside of each button so you can still see the markings after laying down the ribbon. Don’t skip the marking because we’ll be shifting those buttons up and down on the ribbon as we sew. Cut your ribbon about 1.5 times the length of the fly and slide all the buttons onto the bottom of the ribbon. Starting at the top of the fly. Slide one button up to the top of the ribbon leaving about 5/8in of ribbon extending above the top of the button. Position your button to line up with your placement mark, fold under the top edge of the ribbon by 1/4in and pin the ribbon in place. Also pin or mark your ribbon just above the top of your button. 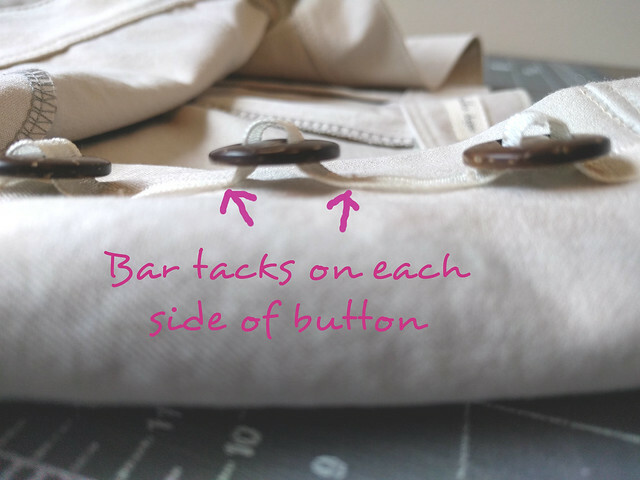 Slide the button down and out of the way to make two bar tacks. One along the top folded edge of the ribbon and the second on the marking for the top of the button. Straight stitch along the edges of the ribbon between the bar tacks. Slide the button back up into position and get ready to experiment with how much slack you’ll need in the ribbon. I tried using a match stick, chop stick, and a couple other things before settling on the shaft of my seam ripper. Place your spacer beneath your button keeping the button centered with your button placement marking. Pin down the ribbon to line up with the bottom edge of the button. Your next bar tack will go where you pin. 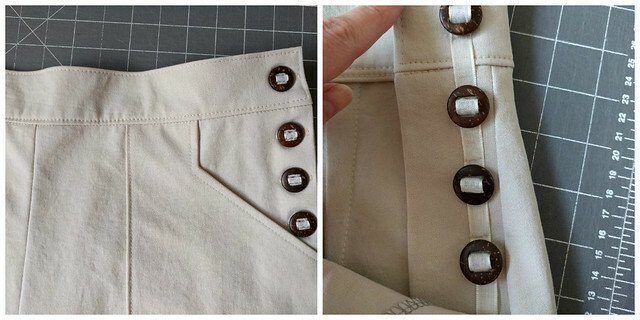 Remove your spacer and test how well the button fits through the button holes. Adjust as needed. When you have the slack determined and the ribbon pinned, slide the button up as far as you can and make a bar tack where you pinned. Your first button is now secured. 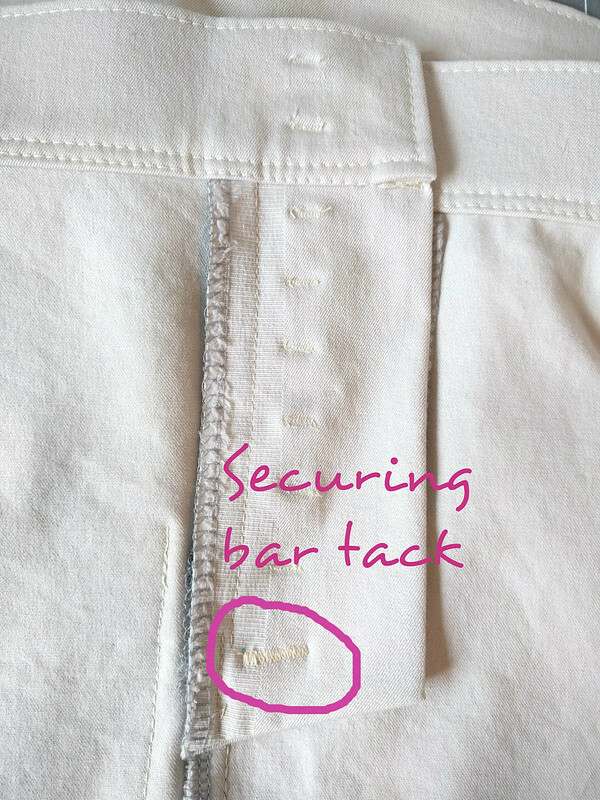 After all your buttons are secured, leave enough ribbon to extend to the bottom of the fly and straight stitch along the ribbon edges to secure. I was also able to catch the bottom of my ribbon in a bar tack that I used to secure my fly pieces together. Trim any excess. Next time I’d do the top button with a separate piece of ribbon. I think I’d like the looks of that better. I’d also apply my buttons before attaching the waistband, then I could secured top edge of the ribbon in a seam and have a nicer finish. Welcome back to Who Made It Best from mahlicadesigns. 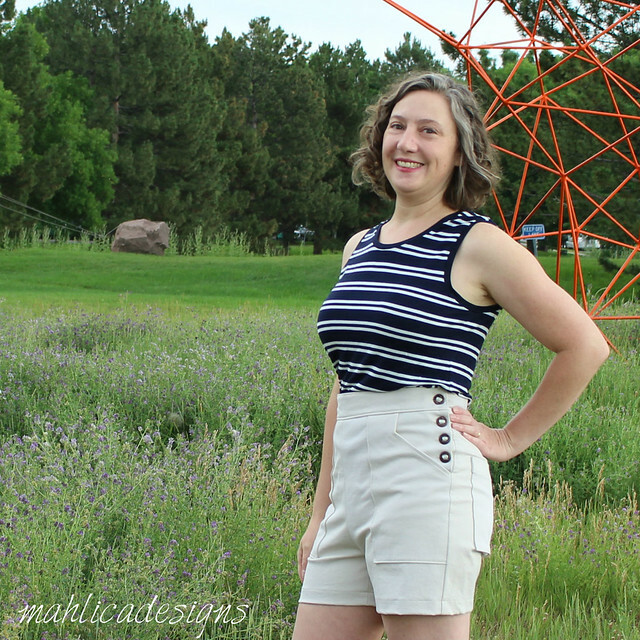 Arielle from Seen & Sewn Patterns has joined me in making up the Lander Shorts for this week’s challenge. Please also check out Arielle’s blog here to see her super cute version. Isn’t this print she choose wonderful? The Lander Shorts are a high waist button fly short/pant pattern with optional expansion pack for a zipper fly. I’ve already made a pair of Lander shorts (here) and pants (here) and was ready to try something different with this pair. My inspiration started with a picture of a side button closure and grew into a board of ideas for what I’m calling my Sail Away outfit. The details I settled on for the shorts are an angled pocket opening, button fly closure moved to the side seam, and a high waist. I’m wearing a Durango tank from Hey June that I modified with a lower neckline and a contrast piece at the lower bodice. Totally forgot to get photos of that- geesh. 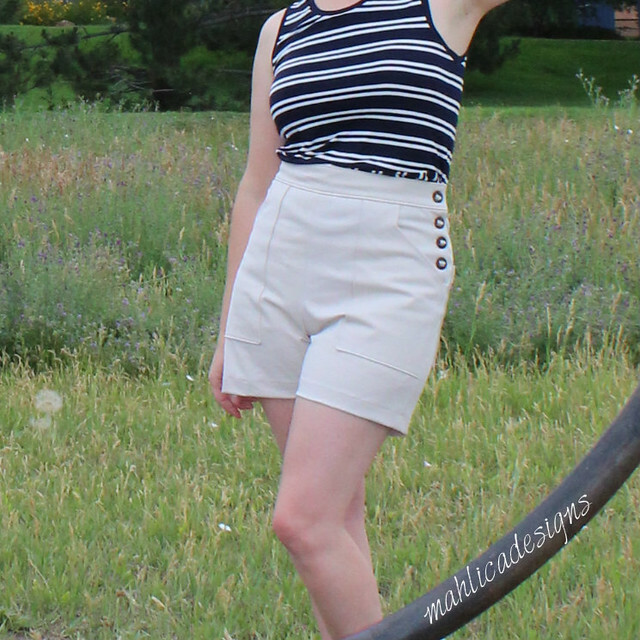 The Pattern: Lander Shorts made in size 6 and modified as described. The Fabric: Khaki stretch twill from Simply By Ti. I only needed 1 yard! So, who do you think made their Landers the best? Please visit Seen & Sewn Patterns for more pictures of Arielle’s version, then place your vote for Who Made It Best. The poll will be on both blogs, so you can see both versions before you choose your favorite. Voting open for one week and results will be posted on Instagram. You can also take a look at the Bronte Tee, Shoreline Boatneck, Sorbetto Top, Greenwood Tank, Cheyenne Tunic, Chi Town Chinos, and Ladies Caroline Dress that were part of past Who Made It Best challenges. As always, thanks for visiting and voting today. Have you seen the newly released Tabor Vneck from Sew House Seven? There are many options to choose from in the pattern, but I was most drawn to the cropped sweater version. I thought it would look great with a pair of Lander Shorts I’ve been planning. The Pattern: Tabor Vneck view 5 (cropped sweater) in size medium with no alterations. This is an easy pattern to put together, but setting in the point on a Vneck can be tricky to do without puckers. The pattern instructions walk you through a construction technique for the V that I’ve had the most success with. The Fabric: The Tabor was sewn using baby French Terry in two toned burgundy from Simply by Ti Fabrics*. This view of the Tabor is made for sweater knits with stretch and the fabric works perfectly. I have the stretch that is required and the baby FT is light enough for spring weather and drapes well. 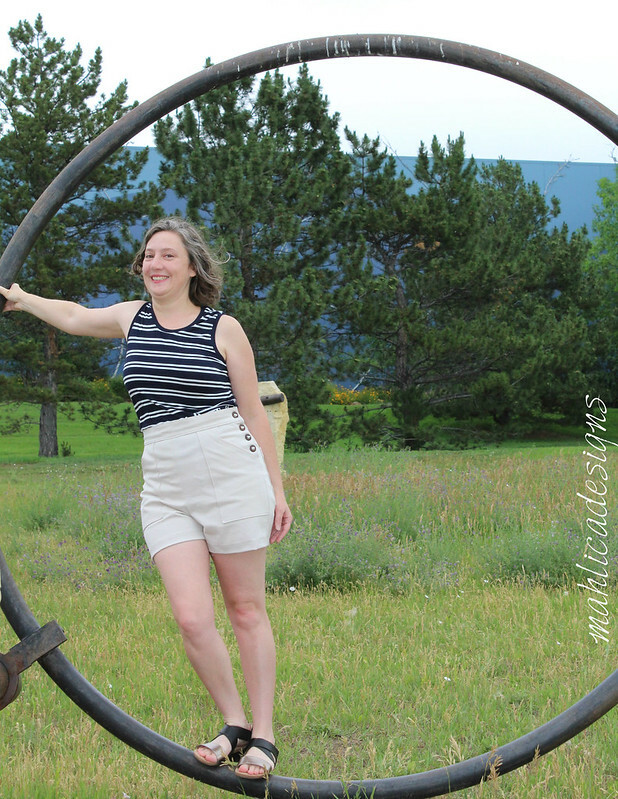 The pattern: Lander Shorts from True Bias Patterns in size 10. No alterations. The fabric: Stretch Denim from Simply by Ti Fabrics*. I did not size down to account for the stretch and they fit just fine for photos, but after a hot humid day at a Florida amusement park they were feeling a little loose. I’d go down a size next time. I’d recommend starting with your regular size and slim down at the side seams if needed (this fitting step is included in the pattern instructions anyway). *As a Simply by Ti Ambassador I received complimentary fabrics for this post from the Simply By Ti shop to use in exchange for sharing it with you. 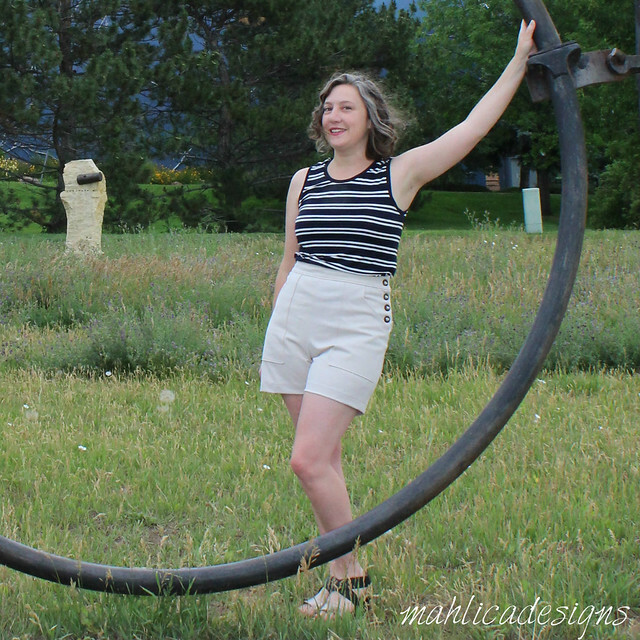 You might also like: The Lander Pants I made for the Breaking Ground Blog Tour. Pin this image, so you can come back when you’re ready to start sewing your versions.